OpenPro offers business software solutions for every company looking for more value and more features from their ERP solutions. Since 1998 we have been delivering web-based ERP software solutions to small and mid-sized companies, and international enterprises. OpenPro supports most industries with a complete ERP software solution. As a provider of manufacturing ERP software, OpenPro excels in providing a full suite of applications within six modules: Distribution, Financials, Manufacturing, Customer Relationship Management (CRM), E-commerce and Systems. With its modular design, customers have the flexibility to select the software capabilities that meet their current need, while knowing our ERP software suite has the ability to expand and grow to accommodate future needs. The System Module provides a wide variety of capabilities to make the system as user-friendly and useful as possible, including workflow management; document imaging; communications; information management system; CMM; knowledge base; and report writer, with a multi-language and multi-currency capability. This image shows all the different OpenPro modules and their individual features. If you would like more information regarding our ERP software, please email infoop@openpro.com and one of our sales representatives will be happy to answer your questions. Or, feel free to peruse our website. Also, remember to sign up for our informative webinar with IBM PureSystems on September 26th at 10:00 AM (Pacific Time)/ 1:00 PM (Eastern Time). 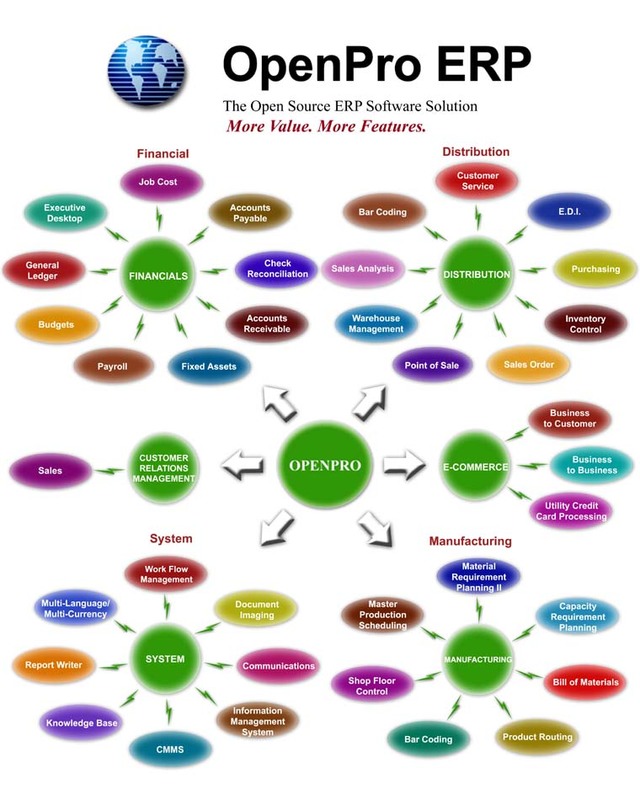 This entry was tagged erp software, features, modules, openpro, reasons to choose OpenPro. favor of his web site, as here every data is quality based material.